On this coop stop we have our 5 quiet 4H chickens as well as a couple baby chicks, all cohabitating with a friendly rabbit. We have a bee yard, but our bees just flew the coop! The bee yard will be open for all to see how it looks with empty hives. Ooo… ahh. Our chicken coop is situated in a tranquil garden setting landscaped with edible plants sprinkled throughout. The coop itself is modeled after the homes in our neighborhood with a twist. It’s constructed of as much recycledmaterials as we could muster. It’s also got a lot of natural tree branches incorporated into it which were gathered after the winter storms. 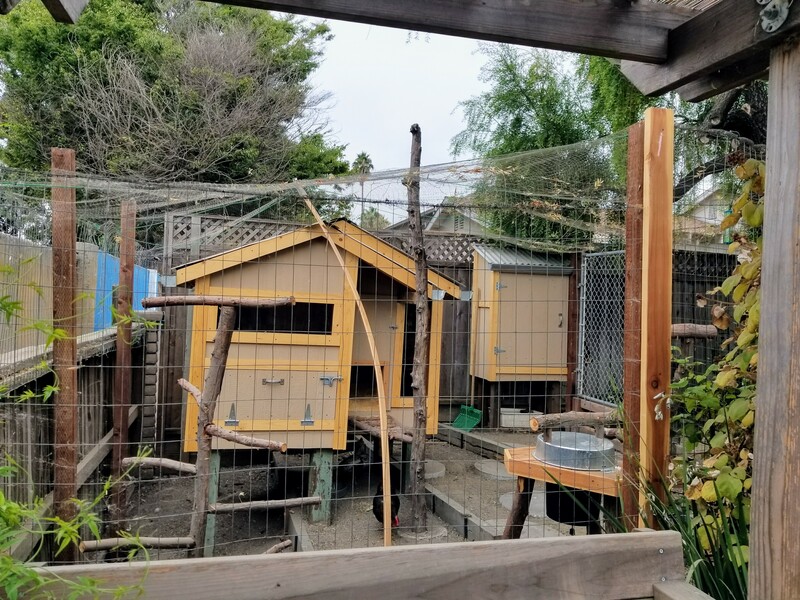 The coop is literally my dream coop thanks to the beautiful and super easy to clean coop, the homemade rat proof chicken feeder and automatic watering system, as well as the built in foraging area where the chickens can snack on fresh greens. I think it’s a dream coop for the yard birds as well. chickens into a tranquil suburban yard that’s made for relaxing. Sit down, take a break and take in the nature all around. Enjoy the view of the surrounding hills, the visiting bees and butterflies, or the chickens in their yard being chickens. moi available for sale. We will possibly have baby chicks available. 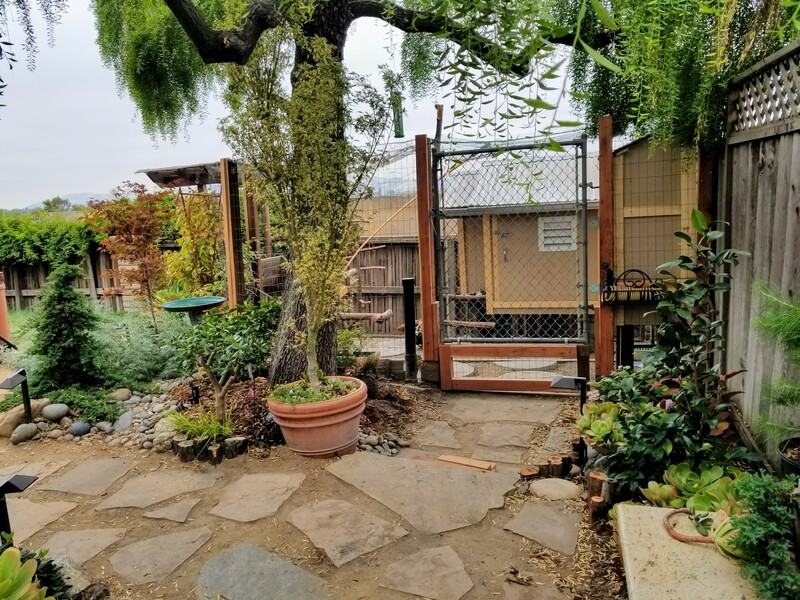 Our coop demonstrates how you can incorporate the perfect house for chickens and those who care for them into a tranquil landscaped yard made for relaxing. Sit down, take a break and take in the nature all around. Enjoy the view of the surrounding hills, the bees busily working, or the chickens in their yard. 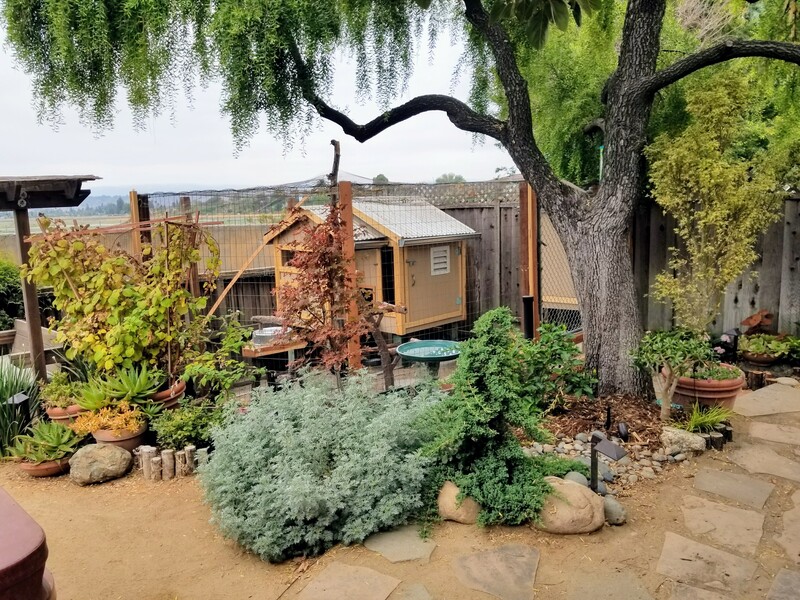 Our coop stop has quite a few tranquil places to stop and relax, from our front yard tree shaded patio seating, to our many built in benches in the back yard. We will be offering cold drinks and some small snacks to our visitors.